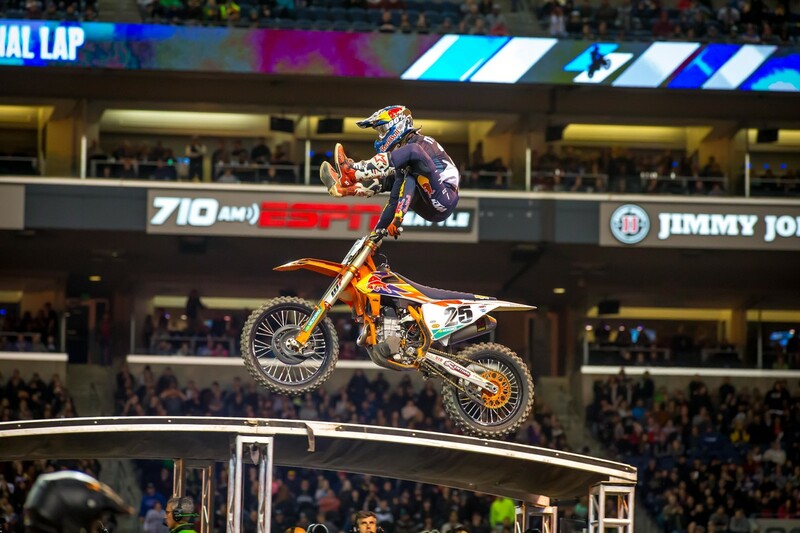 Red Bull / KTM’s Marvin Musquin came into ’19 physically behind due to an offseason injury that kept him off of the bike most of December and he started the season off with an 8th and a 5th, but since round three Marvin has been on the podium in nine of ten races and with his win at the Seattle SX on Saturday night, he now has won the last two main events in a row. 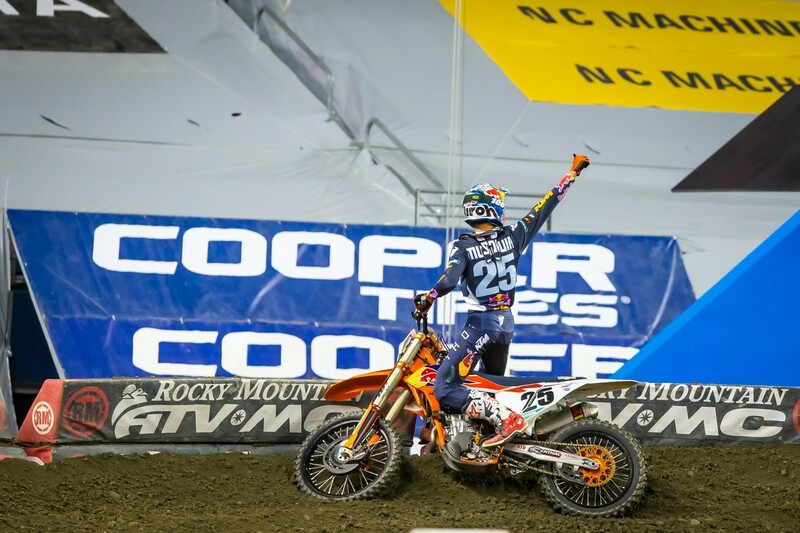 There has been an obvious momentum switch from the points leader, Cooper Webb, to Musquin over the last few races, but it could end up being a mental error that costs the #25 his first 450SX Championship. For now, though, it is at the very least costing Marvin 7 extremely valuable championship points. On lap 2 of the main event in Seattle with Chad Reed, Justin Brayton down on the track and being looked at by the medics in a rhythm section, the red cross flag came out. The flag requires riders to roll every jump, but in the heat of the moment, Marvin jumped double-double into the section. You could tell Marvin immediately realized what he did right as he did it and he even kept it slower than normal in the right turn beyond the red cross area in an effort to sort of make amends for his mistake, but what was done was done. The AMA is not consistent about much when it comes to rulings, but with the red cross, it is a zero tolerance situation. From the AMA rule book, if Race Director determines that there has been a blatant violation of th red cross flag during the main event race and if no positions were gained, the penalty will be the “points and purse equal to two positions in the final results for that race plus two additional points.” In Marvin’s situation, that is the loss of those 7 extremely valuable championship points? It was a bitter sweet heel-clicker in Seattle. With the win and without the 7 point penalty, Marvin would have cut Webb’s lead down to just 7 points. With the penalty, though, the #25 made up zero points in Seattle and Webb’s lead remains 14 points. 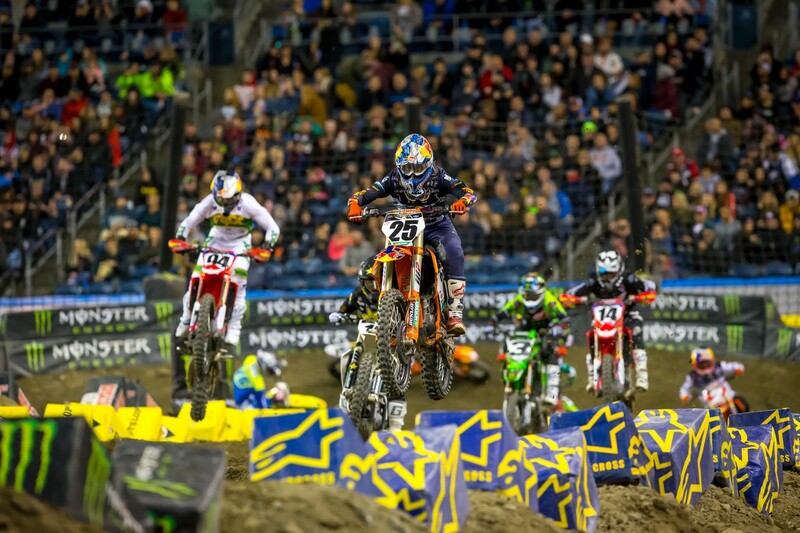 The points may have been awash in Seattle, but Marvin was able to keep the win in the records book, the win bonus money from KTM and the mental edge that comes with winning two in a row. The big question now is, will that momentum be enough to erase a 14 point advantage his teammate and training partner has over him? Well, there is one more question: How awkward is it going to be at the Bakers Factory if these two take it Las Vegas? I’m betting on, very! After the Seattle SX was over and before the 7 point penalty was official, I caught up with Marvin to ask about the impending penalty, his second win in a row and the French win sweep with he and his fellow countryman Dylan Ferrandis winning the 250 class. Marvin, big win for you tonight. You now have two wins in a row no matter what happens with the penalty you might get for jumping on the red cross flag in the main. Especially after Dylan winning the 250, I’m like, yeah, I gotta do it again. And then that will be a first for us to both win. I got a great start. I was second, I got around a Zach [Osborne] right away and I was in a great position. Kenny was right behind me at one point. I was very consistent and really enjoyed it. The track was tough, but I had fun. I pulled the trigger on the big quad in the middle of the rhythm section. That helped me to be smoother through that and jumping the whoops. Everything went awesome. Even after the red cross incident, Ken Roczen (94) was right behind Marvin (25) keeping him honest for the whole main event. There’s was a few big quads. Are you talking about the one after the finish line? The middle one, where you were going 2-4-3? Was that quad something that was on your mind most of the day? It was, yeah. It was! Yeah, we knew from track walk. I just didn’t feel it, but then I was leading and I was like, I got to go if I want to gap the guys behind me. What did you think of the whoops in qualifying today? They were definitely not jumpers in qualifying. Yeah, they were tough. They were tough, but I was decent through them and I had good laptops, so I was pretty happy. It’s nice to see whoops like that because you can actually skim them but also jammed them. So you see two techniques. Talk about having two French riders winning on the same night. Like you said, it’s something you wanted to do forever. Yeah, yeah, exactly. Yeah, it’s a goal. It happened before with Stephane Roncada and David Vuillemin so it’s good to do it again. You know, it’s been a while. It’s tough to do that. Even to win one and then now also Dylan on the 250. It’s awesome. You guys talked about inspiring future young French riders. Are there any young French riders coming up now that you could see following in your footstep. For a while, it seemed like there was a consistent flow of French riders, but that’s slowed down. Do you see some in the bullpen that will be coming? Yeah, yeah, a few. But obviously they are in Europe. They race the world championship or the European Championship. Obviously, I grew up racing 85’s and we had a supercross championship. They kind of stopped that. So that will help to see more SX championships in Europe for kids. So you grow up racing supercars already. I missed it from the press box, but I have to ask before I let you go, what happened, what happened on the jumping on the red cross flag deal? The rule is you’re going to lose seven points if your penalized, but the win stays in the record books..
Yeah. I mean, we’ll see. I haven’t talked to the AMA yet. But yeah, I was leading and you know, you have the pressure from the guys behind. I did slow down. I was careful, but I did jump, so we’ll see.